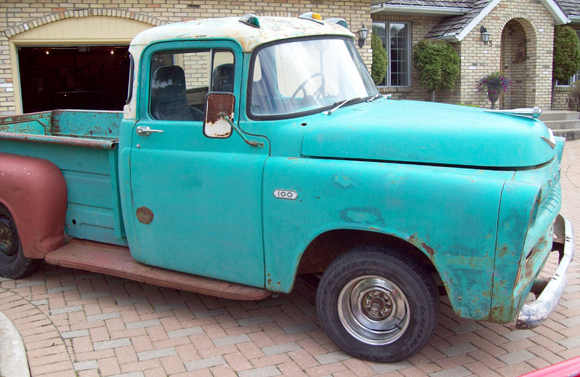 Dodge Hemi D100 Pickup. With a 331 cu in Hemi. Original 4 speed trans. Ford CrownVic rear end. Wrap around rear window. B.C. truck with minimal rust. Photos show a lot of stone chips although exterior running boards are rusty. Floors are solid. Wood floor in bed. New windshield and new dual exhaust. Original Cryco turn signal operator. Bucket seats. Grille is made/installed from a Volvo semi-truck cam shaft. (not shown in photo)Even the rooftop lights work. This truck runs/drives but is ready to go to the next level. E-Mail if you have questions. Imagine building it into something like this?